Currently, the two most popular mobile platforms are Android and iOS, which have grown in the last couple of years. Both of them have been innovating their app stores to compete in the software market for quite some time now. The App Market Analyzer has allowed experts to evaluate the available app market data by arranging it into a simple format that is much easier to understand. Also, a Google Play App market analysis done by the market intelligence firm App Annie reported that Android’s Google Play is now leading the market with a 90 percent higher download rate than Apple’s App Store. 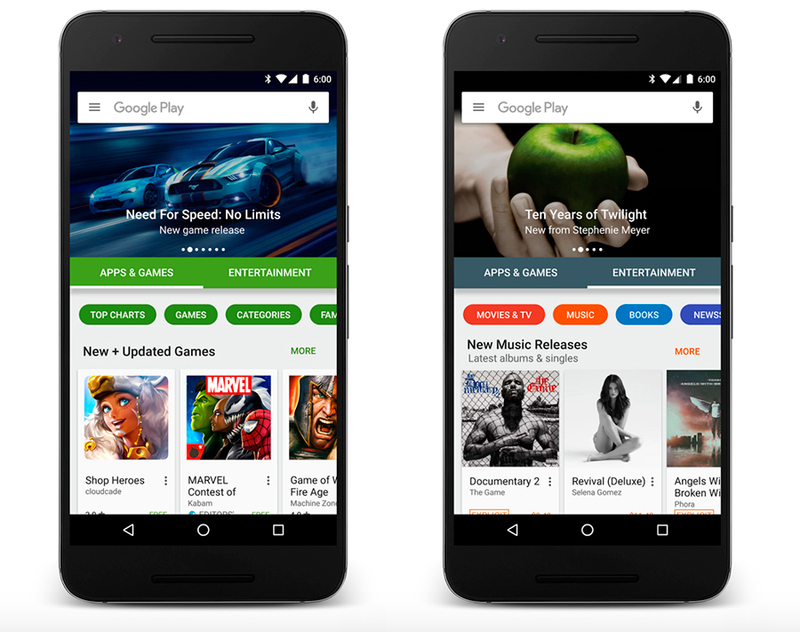 But now thanks to Google’s software engineer Kirill Grouchnikov, we have learned that Google Play Store is also getting a new design to offer its clients more than just simple apps and widgets. We were able to get a sneak peak of some of the changes. Screenshots of the interface were published this week on his online profile where scrolling animations and navigation improvements were revealed as well as the change from six category to two main ones: Apps & Games and Entertainment. This second part includes TV shows, Movies, Newsstand subscriptions, and Books. Other visual elements like colors were included into this upgrade; the Apps & Games section is shown green while the Entertainment is more colorful by being displayed in different colors. On the other hand, you can now also view the top ranked of what’s new on the “highlights” section, which can make navigation much simpler so the user can discover new content easily. As much as the users anticipate the update, it’s still a few weeks away from being released.